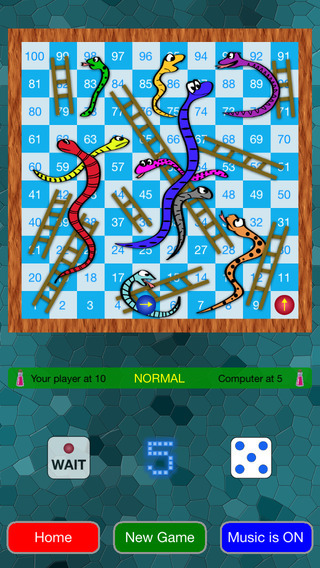 This app was released in February 2014, based on a promise to my daughter that I would make her a Snakes and Ladders game. It gives you the option to play a normal game of the classic Snakes and Ladders board game, as well as a “reversed” mode where snakes make you go up and ladders make you go down. In addition, an option for a random mode exists, which flips between the two methods at random intervals. Later I added another option to include a “lifeline”, i.e. a potion, which you can use once per game to prevent yourself from going down a snake. This added a strategy component to an otherwise random-chance game. This was the first game of mine that I can actually call a “success”. It went #1 in the UK and the Philippines under the category “Free iPad Dice Games”, and stayed in the #1 and #2 position in the UK throughout the month of August 2014 (source: Distimo). The Windows Phone version was published a year later, in March 2015.